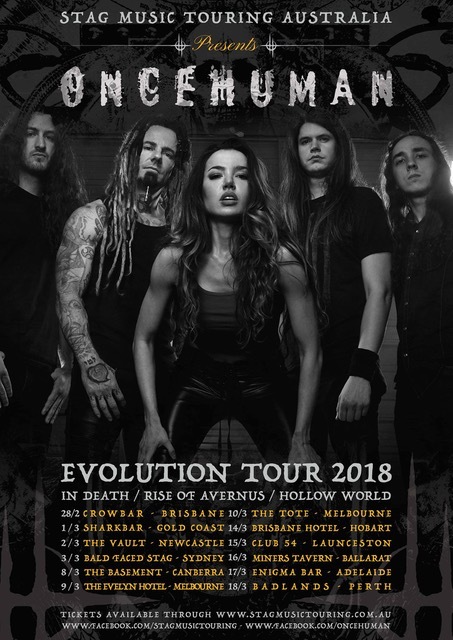 Led by guitarist/renowned producer Logan Mader (ex-Soulfly, ex-Machine Head) and vocalist Lauren Hart, American melodic death metallers Once Human issued their second full-length Evolution earlier this year. They’ll also embark upon their first Australian tour in 2018. Hart, 31, has dual citizenship; she was born in the US, relocated to Australia in her teens and is now based near Las Vegas. Loud chatted with her about the “homecoming” tour, her vocal influences, covering Machine Head live and more. Q: Once Human will make their Australian live debut next year. How are you feeling about that prospect? A: Oh, I’m so excited. I’m really excited to show the guys Australia as well. I know that Logan and Max (Karon, guitars) have been there, but they have only ever been there for a few shows and they never had that much time off, so I’m excited to take everyone around. We’ve got a few days off in Sydney, so I’m going to take them all to the Blue Mountains and hopefully they’ll pat some kangaroos and all that (laughs). But mostly I’m excited for them to see the culture, meet all the people, and I want them to fall in love with Australia the way I love Australia. Hopefully we’ll get some nice weather, and it should be a great time. There’s quite a few people that want to buy us some drinks, so I assume there’s going to be a lot of alcohol consumed (laughs). Our live shows are full of energy, lots of fun and we don’t really take ourselves seriously on-stage. (There’s) a lot of interaction. I like talking to people in the audience and yeah, it’s just full-on energy and we do have lots of fun. Q: It is an extensive run of shows you’re undertaking as well – it’s not just a fly in for three gigs and then head home type of deal. A: Yeah. It’s funny, because even before I was in this band I always had this dream of doing like a camper-van tour around Australia, just driving everywhere. And that’s sort of what we’re doing. I think it’s in a bus, but still, it’s the best way to see everything. I don’t think I’ll even be sleeping that much because I just want to take it all in. I’m really glad that they made it this way. I think there’s a few fly dates, but mostly it’s driving. Q: There are metal fans in Australia who are already familiar with your story as well as Once Human’s music, but do you feel like many heavy music listeners in this part of the world are only just becoming aware of your history? A: I’m not even sure, I didn’t know that there was any sort of… I don’t know exactly what the following is in Australia, but I thought that was kind of the point of going there is to just get people excited, and I think these days, people have to sort of see it to believe it. Just because there’s so much on YouTube, and there’s just so much out there, that in order for people to really like fall in love with you and pay attention to you, you’ve really just got to play for them. And I think for Australia as well, just showing them how proud I am (laughs) I guess of being an Aussie, and just going out there and having a good time. Q: So how many years ago did you return to the US? A: I moved back indefinitely in 2014, and that’s exactly when I met Logan. I met him probably within a month of being back. It was just fate, it was weird how it all happened. I even stopped playing music for a long time. I never really gave up guitar, but I just kind of would pick it up, mess around and put it away… I wasn’t like pursuing anything, but as soon I got here, for some reason it just came in full swing and I met someone who sent my music to Monte Conner. I didn’t know who he was at the time, but he was head of Nuclear Blast I believe at the time, or doing A&R. Then Monte sent it to Logan to say, ‘Hey, check out this girl, maybe you guys could work something out, or you can build something around her’. I was doing like metal riffs on guitar and I was guess that was kind of a rare thing to see at the time (laughs). So Logan called me in and straight away we hit it off and started doing co-writes, and then begged him to be in a band. He started by picking up the bass and then eventually I’m like, ‘You’re a guitar player, what are you doing?’ (laughs). So now here we are. Q: It seems like it can be a real grind to attempt to get noticed in L.A, not to mention being a ruthless town in many ways. A: Oh yeah. I couldn’t even get a day job. I was going in trying to get a waitressing job, and they were asking me for like head-shots and stuff (laughs). L.A is so… It’s not easy. But the networking’s really good, and obviously things sort of happened for me even without pursuing it. So there are people that you meet. But the internet, you can do a lot of networking that way anyway. You don’t have to like leave home at… You don’t have to go to L.A I don’t think anymore to make those connections. YouTube and making your own music and putting it up, I think it’s such a big tool, and social media and stuff. Obviously there are people out there; I just got lucky, I got super lucky. Q: Who are your main vocal influences? A: I loved Shagrath from Dimmu when I was younger, of course Angela (Gossow) from Arch Enemy. Devin Townsend gives me chills every time, especially Strapping Young Lad because I loved his vocals on that. I think a lot of people would assume Angela, and I do think that she’s still… I bow down to her (laughs). Q: Have you met her? A: No, I would love to. One day, that’s a dream of mine. I would love to meet her and hear her scream again. I heard that she’s coming back, doing another heavy band. So I’m looking forward to hearing that. Q: Why do you feel you possess a musical and songwriting chemistry with Logan? A: What he tells people is and how we hit it off is, he normally gets girls coming in there wanting to be like, wanting to do radio stuff and radio-rock. I guess I came in, and I originally told him ‘No clean singing at all’. I just wanted to do pure metal, and I showed him some of the stuff I was into. I guess he found that pretty refreshing. So we connected on a raw level, and I guess that’s how it all started. It made him feel, I think it allowed him to start writing things that he didn’t get to write for a long time, just because he was writing for radio bands, and it’s a different sort of formula. This allowed him to sort of be himself again. I think we just connected on a real raw level in that way. Q: Once Human has also acknowledged his past by covering Machine Head’s “Davidian” live. Is that still a part of the set-list? A: Yeah, we’re going to bring it. We’re going to do that. We released it on the Evolution album, but it was only on the Japanese edition, so we’re going to get it out either online or… Somehow streaming, because a lot of people have been asking for that. But we’ll definitely be playing that. Q: It seems like Machine Head might not be playing that song live in the near future. Robb Flynn recently suggested the band was reconsidering performing it after the Las Vegas shootings. A: Yeah. I think they’ll change their minds. I think that was just the whole shock of what happened. Obviously he was being respectful and doesn’t want to… You understand why he doesn’t want to do that, but it won’t stop us from playing it. Q: Changing topics, what other work or projects do you have besides Once Human? A: I’m doing some toplining work. That’s when somebody has music, like a band has music and they’ll send it to me and I’ll do like a topline on top of it, which is the lyrics and the melody. I give it back to the band, and they like it or they want to change certain things and collaborate. I’ve been doing a lot of that and that’s a lot of fun for me, because some of it is outside of metal completely, so it’s a little bit challenging, but fun. It allows me to play with different voices, because when I do songs for different bands, I try to sort of, when we record the idea that I have, I try to sound a little bit like the singer for the band. Just so they can get the context of how it would sound if they did it. It helps me discover more voices within myself that I didn’t know I had, and use different tones that I didn’t know I had, just by imitating someone else. I guess it is imitating; it’s me, it just sounds a little different, and it helps me discover new voices. I feel like after going really intense into Once Human and diving really deep into the pool of emotions (laughs) that I’ve been hiding from the world and getting all of that out, it’s really nice to do something lighthearted for other bands. So it’s a nice little outlet in itself. I’ve been doing a lot of that, which is fun, and just the odd job here and there to pay the bills. A: I’m really excited to come home.